Monseigneur Donat Robichaud was born in Shippagan on October 6, 1924, the son of Alexandre Robichaud and Élizabeth Boudreau. A very gifted student, his parents sent him to the seminary in Bathurst at the age of ten, when pupils were supposed to be 13 in order to be admitted. That was how he obtained his Bachelor of Arts degree from the Université du Sacré-Coeur in Bathurst at the age of 18 in the spring of 1943. He entered the Holy Heart of Mary Seminary in Halifax in September 1943. By the age of 21 and a half, he had completed his studies at the Seminary and was ready to be ordained, but since the canonical age for becoming a priest was 24, a dispensation from Rome would be needed in order to be admitted. 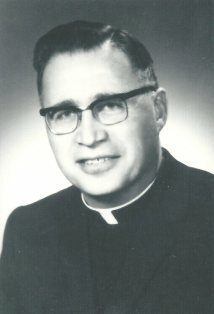 He was ordained a priest in Shippagan on September 20, 1947. He began his religious life as a curate in the following parishes: East Bathurst, Dalhousie, Caraquet, Tracadie, Petit-Rocher, and Atholville. 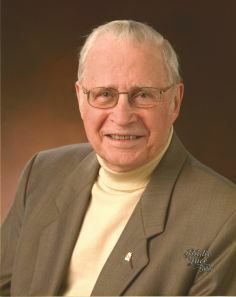 In 1964, he became a professor at the Petit Séminaire Saint-Charles in Bathurst, and in 1968, he accepted the position of superior of that institution. He was the priest of Beresford parish from 1971 to 1987, and he ended his ministry as the parish priest of Paquetville. He retired officially in 2000. On two occasions, he was the Diocesan Administrator, i.e., in 1985 and 1989, following the deaths of Bishops Godin and Richard. Monseigneur Robichaud found history and genealogy a passionate diversion and pastime. He spent his spare time and vacations on these activities. He mentored many history enthusiasts whom he encouraged with wise counsel on research and publication. He was always willing to share the vast historical knowledge he had acquired and as such, he was a much sought-after guest speaker. He never asked for his travel expenses to be paid. His greatest reward was to share regional and Acadian history as much as possible. Aware of the fact that the research instruments in history and genealogy were missing, he pushed for the publication of baptism, marriage, and death registers in the various parishes of northeastern New Brunswick. He proceeded to catalogue information from the Gloucester County Registry Office, which he published in 12 volumes, covering the years from 1827 to 1891. He read many newspapers and summarized the most relevant articles in his publications. The newspapers included The Mercury (1826-1829), Miramichi’s The Gleaner (1829-1880), Bathurst’s Le Courrier des Provinces Maritimes (1885-1903), and L’Évangéline from 1887 to 1957 in eight volumes. All of the articles are provided in chronological order with an index at the end of each volume. These publications are indispensable research tools and are very useful for anyone wanting to do historical or genealogical research. His patience, determination, courage, and perseverance in all of his undertakings allowed him to achieve his major projects. A tireless worker and someone blessed with a very generous spirit, his greatest desire was to be of benefit to others through his research and knowledge in history and genealogy. After a long battle with cancer, Mgr. Robichaud died peacefully at the Bathurst Hospital Centre on August 8, 2009, at the age of 84. He is buried in the cemetery of his native parish of Shippagan. Note: Those who would like to know more about the life of this exceptional person can consult his autobiography, which he published in 2006: Douce souvenance / Donat Robichaud. - Moncton, N.B. ; Lévis, Éditions de la Francophonie, cop. 2006. – 476 p.
This project was made possible through the assistance of the National Archival Development Program (NADP) of Canadian Heritage, Library and Archives Canada, and the Canadian Council of Archives.